This weekend is the reenactment commemorating the 200th anniversary of Holy Ground between Montgomery and Selma, during the 1813/1814 Creek War. Above is an image of the local folklore of the battle, when William Weatherford leaped off a cliff on his horse. I was hoping to be at the even this weekend, but after the hospital visit last Friday, I need to stay off my feet. I am not able to stand for a very long time due to what happened. I am doing better, but I should take it easy for a while. And should not drive far on the medication I am on. 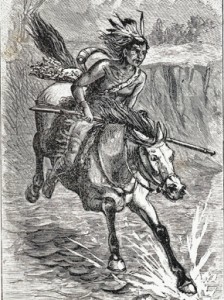 During the battlefield, Weatherford is seen leaping off the cliff of the river on his horse to escape the troops. Contemporary Creek authors Woodward and Stiggins say that it was an exaggeration, that Weatherford just double-backed on the side of the bluff and the soldiers just thought that he took the leap. But it is one of the well-established folk tales in Alabama folklore. I think the drive would wipe me out more than anything else. About four hours one-way. I went almost the same distance driving Dr. Joe to Fort Cooper & back two months ago; and it turned into a 12 plus hour day and we were wiped out afterwards. I will enjoy all the Christmas decorations in town instead.